UP Election Results 2017: PM Modi led the party in an intense campaign to win the state after 15 years. 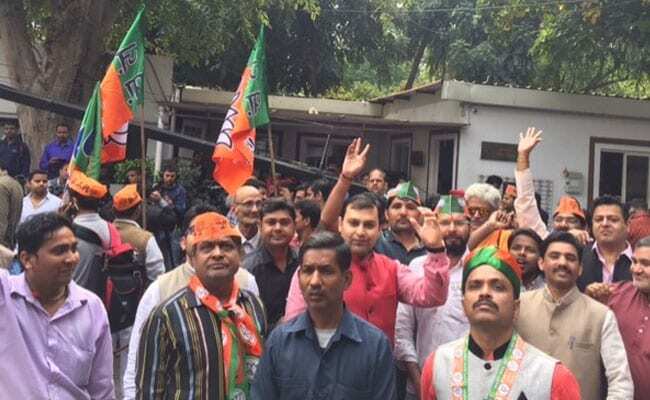 New Delhi: The Bharatiya Janata Party (BJP) has posted a spectacular win in Uttar Pradesh and is set to win over 320 of the state's 403 seats. The party has credited the victory to Prime Minister Narendra Modi's leadership. PM Modi led the party in an intense campaign to win the state after 15 years. The Akhilesh Yadav-led Samajwadi Party-Congress alliance and Mayawati's Bahujan Samaj Party (BSP) have been reduced to numbers that are a fraction of their seat tallies five years ago. The SP- Congress alliance is set to win only 60 seats while the BSP is trailing at 18 seats. Outgoing chief minister Akhilesh Yadav is expected to meet the state's governor this evening to resign. The VBJP did not project a chief ministerial candidate in UP and party chief Amit Shah said today that it would select a leader for the top post on merit. The marathon Uttar Pradesh elections were held in seven phases between February 11 and March 8. For results of all constituencies, click here.